A tornado is a rapidly spinning column of air formed in severe thunderstorms. The rotating column, or vortex, forms inside the storm cloud (cumulonimbus), then grows downward until it touches the ground. 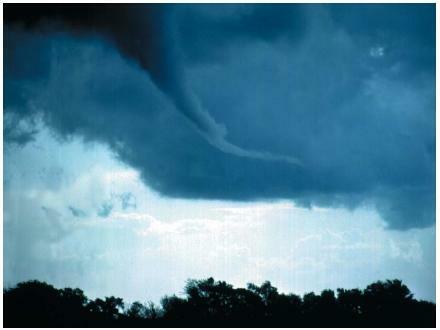 When a tornado is visible but does not touch the ground, it is properly called a funnel cloud. A tornado in contact with a body of water is called a waterspout. deaths, 1,500 injuries, and millions of dollars of damage annually in the United States. Although tornadoes can occur at any time of the year, most form during the months of March through June, when conditions are right for the development of severe thunderstorms. In a severe storm, rain that falls from a cloud causes downdrafts (sinking air) in the rear of the cloud. Meanwhile, the advancing edge of the storm has strong updrafts and humid air is pulled into the storm. As this humid air rises and cools, its water vapor condenses to form more water droplets, releasing heat in the process into the surrounding air. This latent heat, in turn, causes the air mass to rise ever more quickly, strengthening the storm. As updrafts in a severe thunderstorm cloud get stronger, more air is pulled into the base of the cloud to replace the rising air. Some of this air may be rotating slightly since the air around the base of a thunderstorm always has a certain amount of vorticity or "spin." Fujita Tornado Scale: A scale of six categories that rates tornado wind speed based upon the observed destruction of the storm. Funnel cloud: A fully developed tornado vortex before it has touched the ground. Latent heat: The heat released when water vapor condenses to form liquid water. Vortex: A rotating column of a fluid such as air or water. Vorticity: The tendency of an air mass to rotate. Waterspout: Tornado in contact with a body of water. As the air converges into a smaller area it begins to rotate faster due to a law of physics known as the conservation of angular momentum. This effect can be seen when an ice skater begins slowly spinning with arms outstretched. As the skater brings his or her arms inward, the skater's rate of rotation increases dramatically. In the same way, as air converges into the strong updraft of an intense thunderstorm, its rate of spin increases. Meteorologists still are unsure whether tornadoes form deep within clouds and extend downward or form underneath the cloud and extend upward. It is possible that both situations occur. Tornadoes move with the thunderstorm to which they are attached at an average speed of 35 miles (56 kilometers) per hour. They have an average path length of about 5 miles (8 kilometers). The diameter of a tornado can vary from 300 feet to 1 mile (90 meters to 1.6 kilometers). Tornadoes come in a variety of shapes and sizes, and often have an ominous dark color due to the soil and other debris they pick up as they move along. A dust devil is a relatively small, rapidly rotating wind that stirs up dust, sand, leaves, and other material as it moves across the ground. Dust devils also are known as whirlwinds or, especially in Australia, willy-willys. In most cases, dust devils are no more than 10 feet (3 meters) wide and less than 300 feet (100 meters) high. Resembling mini-tornadoes, dust devils form most commonly on hot dry days in arid regions such as a desert. They originate when a layer of air lying just above the ground is heated and begins to rise in an updraft. Winds blowing in the area cause this rising air mass to rotate, either clockwise or counterclockwise. In some cases, wind speeds can easily exceed 50 miles (80 miles) per hour. Some large and powerful dust devils have been known to cause property damage. In the vast majority of cases, however, dust devils are too small to pose a threat to buildings or to human life. Tornado strength is classified by the Fujita Tornado Scale, or F-scale. Developed by T. Theodore Fujita of the University of Chicago, the scale measures the power and destructiveness of tornadoes. The six categories of the scale (F0 through F5) classify a tornado by the amount of damage it causes—from light to incredible—and its wind speed—from 40 to more than 300 miles (64 to more than 482 kilometers) per hour. It is estimated that 90 percent of all tornadoes have wind speeds below 115 miles (185 kilometers) per hour. The deadliest tornado in United States history was the Tri-State tornado on March 18, 1925. Beginning in Missouri, the tornado stayed on the ground for almost 220 miles (350 kilometers), moving into Illinois and Indiana. In places, it left a trail of damage almost 1 mile (1.6 kilometers) wide. The Tri-State tornado plowed through nine towns and destroyed thousands of homes. When the storm was over, 695 people had lost their lives and more than 2,000 were injured. Another historic storm was the severe tornado outbreak of April 3-4, 1974. This so-called "Super Outbreak" triggered 148 tornadoes over 13 states, devastating an area from Alabama to Michigan. More than 300 people were killed and more than 5,000 were injured. Property damage was approximately $500 million. On May 3, 1999, a storm started near the town of Lawton in southwestern Oklahoma. By the end of the day, it had grown into a violent storm system with a reported 76 tornadoes. As the storm system tore across central Oklahoma and into Kansas, more than 40 people were killed, over 500 were injured, and more than 1,500 buildings were destroyed. One of the tornadoes in the system, classified as an F5, had a diameter of 1 mile (1.6 kilometers) at times and stayed on the ground for more than 4 hours. The precise tracking and prediction of tornadoes is not yet a reality. Meteorologists can identify conditions that are likely to lead to severe storms and can issue warnings when atmospheric conditions are right for the development of tornadoes. They can use radar to track the path of thunderstorms that might produce tornadoes. Yet it is still not possible to detect a funnel cloud by radar and predict its path, touchdown point, and other important details. Scientific research in this area continues. i think this is cool i really like tornados i would to study them one day, i'm a 10th grader. thank you for sharing this with me, i really mean it. nebraska in 2004 it was 2.5 miles wide and the 2 biggest tornado was greensburg kansas at around 2 miles wide (which destoryed 98 % of the town) I hope this helps you . I always love to do tornadoes project at school!!! hi During a tornado the winds spiral inward and upward violently. These winds can cause catastrophic damage in some cases, destroying homes and businesses, and sometimes entire downs. The birds knew long before I did that an F3 was coming. HOW.? Hi. I'm doing a Science Project on tornadoes and I'm trying to research the characteristics of the tornado. If anyone can help me with the project that's great. Thanks! I'm doing a science project and this helps me alot.This will be my website to always use to help me on my project. What is one of the worst tornadoes in human history? What takes place during a Tornado? Thats the main question I need help with for my project.